Keeping pet beetles and their larvae is generally easy to do, when you know what they need. 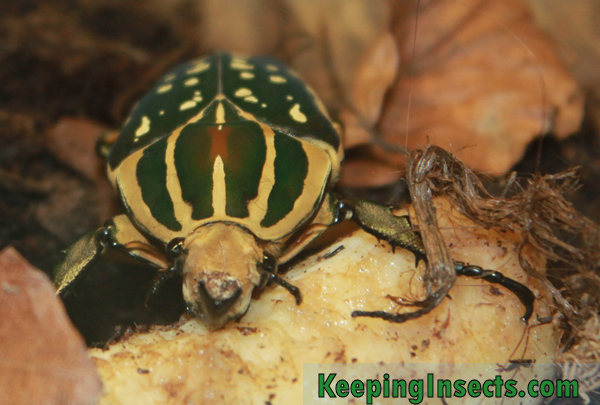 This page will take you through the basics of keeping pet beetles and larvae. How to house your beetle larvae depends on the species you have. With 400.000 species of beetles on the earth there are almost as many different ways to keep them. What the species you are keeping needs, can be found at the Species Description page. For now I will only cover how to care for larvae that live in soil. To keep larvae that live in soil, you need a thick layer of soil in a plastic box with enough ventilation. The layer of soil needs to be 10 to 20 cm thick. How big the plastic box should be depends on the size of your species of beetle and on how many beetle larvae you want to keep in the box. Every grub needs at least 10 cm in all directions around it to have some space of its own. Some larvae are cannibalistic, so you can only house them individually. You need to keep the soil moist, but not extremely wet. What beetle grubs eat depends on its species. This description can only be used for species that live in the soil. Most species that live in the soil will eat decaying wood, decaying leaves and other rotting plant material. This makes feeding them really easy: you need to supply them with leaf litter and rotting wood. Fresh leaves and wood that is not decaying is not suitable. You can find decaying wood and leaf litter in any forest, bushes or woodland area. You can collect the material by hand or just take a spade and dig up some soil with the material in it. Make sure you do not take soil that has pine trees or conifers on it, because the needles of these trees cannot be digested by the beetle larvae. You can mix the decaying plant material with the soil in which you keep the larvae. When placing the material on top of the soil the larvae will generally also eat it, but it is better to distribute the food evenly in the soil. To boost growth you can add some dry cat food to the soil. Make sure the soil is moist enough to make the dry cat food moist enough for the beetle larvae to eat it. Every species of beetle larvae needs its own temperature and soil moisture. Make sure to check the caresheet of your species to find out what it needs. You can keep the soil moist by spraying with water or by pouring a little bit of water onto the soil and then mix the soil carefully. Regularly check the amount of food the larvae have by stirring in the soil, sometimes they run out of food quicker than you think. You do not need to keep the pupae differently from the larvae. They should be at the same humidity and same temperature as the larvae, and they should be left on the spot in the substrate where they decided to pupate. The beetle larvae generally make a cocoon of sand and protein around them before they pupate. Don’t destroy this cocoon, as it is protecting the pupa inside. After a few weeks to even one year the pupa will eclose and a beetle will emerge. A glass or plastic tank / terrarium with a layer of 2 inches or more of humid soil and a few pieces or wood or bark on this soil. The tank should be at least 5 times the length of the beetle in height and in width to ensure it can walk around enough, but a bigger space is ALWAYS better. Fill the terrarium with some branches or twigs where the beetle can walk on. When you heat the terrarium with a light bulb, the beetle can move on the twigs closer or farther from the light to choose its preferred temperature. You can put some live plants in the enclosure, but it is possible that the beetles will slowly destroy it or eat it. Check what kind of temperature and humidity your species of beetle needs, and adjust the environment to match these conditions. The best way to heat the terrarium of beetles is with a light bulb that also emits heat. Any ordinary incandescent light bulb will do this. Because you heat the terrarium with radiation from the lamp, it is similar to the sun. The beetles can then bask in the sun to heat up, or choose to hide in the shadows to become cooler. Beetles can only adjust their body temperatures in this way. If one light bulb does not produce enough heat, you can heat the enclosure some more using heat mats or a heat cable. You can increase humidity by spraying with water. Do not supply the enclosure with a water bath or something similar, because the beetles can drown in this. Again, what your beetles eats depends on its species. This general caresheet only deals with caring for fruit eating beetles. Fruit eating beetles eat fresh fruits and sometimes nectar. To feed the beetles you can offer banana, apple, orange, grape, pineapple or mango (among other fruits) on a ceramic or plastic plate. Just place this in the middle of the enclosure, preferably not directly under the light bulb. The beetles will find it and you can see them eat from it. After two days you have to remove the fruit and supply new pieces. Beetles should have fresh fruit at all times. Because feeding beetles with fruit can give you a fruit fly problem in your terrarium, you can also buy special beetle food. This is pudding-like food supplied in a small plastic cup. It does not attract fruit flies and is good food for your beetles. Often it has the brand name Beetle Jelly.